Yesterday morning my daughter was half an hour late for school because I could barely drag myself out of bed. Once I’d dropped her off I sprawled listlessly on the living room sofa vaguely concerned about how I’d summon the energy to go collect my little love midafternoon. I also thought I had an appointment or something but hadn’t gotten any reminder calls so I shrugged it off. He brought our daughter back covered in frosting and probably with a cavity, changed back into his uniform and headed back to work. And when he came home from work he brought me more water and proceeded to fold the mountain of clean laundry I’d piled up. Eight years ago, my husband surprised me with a classically romantic Valentine’s Day complete with jewelry, dinner, and tickets to the ballet yet it’s this Valentine’s Day that I’m utterly overwhelmed with his love and devotion. A seasonal twist on the old kids’ song “If You’re Happy and You Know It.” The flashing lights and happy animals draw in the preschool set. 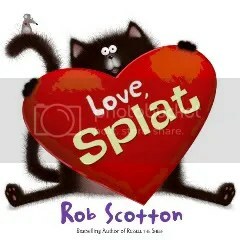 My daughter first met Splat and Seymour in Splat the Cat, which is one of her all-time favorite stories. Here, Splat and his classmates are preparing for Valentine’s Day, and Splat makes a special Valentine for Kitten. But Spike’s Valentine for Kitten seems bigger and better than Splat’s. Which will Kitten prefer? 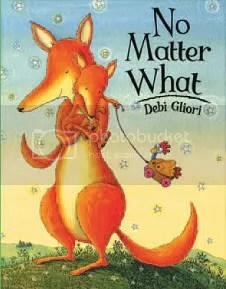 Small worries that Large’s love will fade or change, but Large comforts Small and promises to love Small “no matter what.” I gave this book to my daughter the first time that I had to be away from her overnight, and it is still one of her favorites even though it is a very short read. 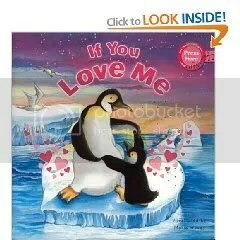 A good board book for 2’s and up. This is a gorgeous pop-up book, and a fun addition to the Strega Nona series. Strega Nona describes the six essentials for a good life—family, food, friends, celebration, patience, and—of course—love. We were fortunate enough to meet author Tomie dePaola at a book signing at Jabberwocky. Final thoughts on reading love tomorrow.